An empowering guide to cultivating confident, passionate, and powerful young leaders during the most formative stage of life: the middle school years. After years of research as a psychologist and consultant for women struggling in the professional world, Stacey Radin made a groundbreaking realization: it all begins in middle school. Women who become successful leaders learn how to do so in the middle grades—the most formative stage in a girl’s development and self-identification. 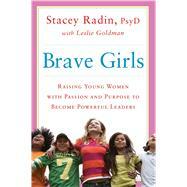 Drawing on her own experience with Unleashed, an after-school program dedicated to empowering girls through puppy rescue, Radin has written Brave Girls­—the ultimate guidebook for parents and educators who want to learn how to help their girls become confident, passionate, and powerful leaders. At a pivotal time in their lives, girls learn to advocate for others, think critically, and, most importantly, gain confidence in their ability to create change. Perfect for “anyone concerned with girls and women’s lives” (New York Times bestselling author Michael Gurian), Brave Girls shows how contributing to one cause can shape a leader for life while reducing the hazards of middle school—bullying, excessive competition, fear of speaking out—and identifying the patterns that truly make a difference. If we take initiative early enough, we can inspire today's girls to become the next generation of strong, enthusiastic, and fulfilled leaders in all areas of society.